LOVE THIS!!! The color is a little more on the rusty side was expecting a little more red but the rust color is more what I wanted so pleasantly surprised. This was easy to put on ( as easy as a duvet cover can be) and is super comfy even when we just had 3 days of subzero temps!! 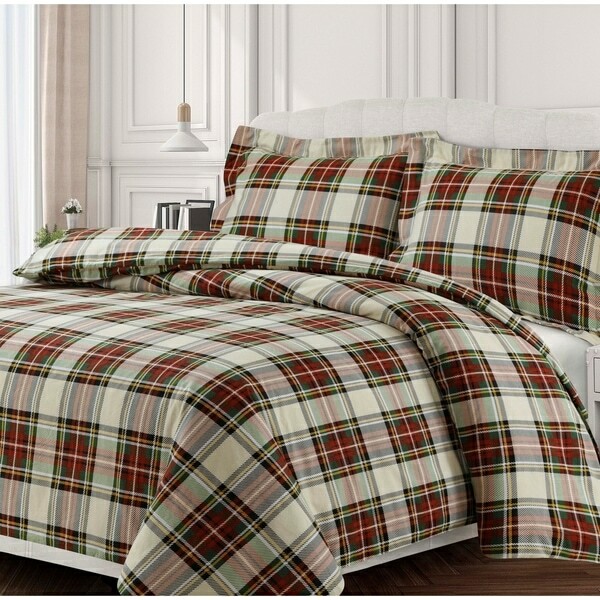 This soft, cozy duvet set is perfect for cold winter nights and will coordinate with any holiday bedroom decor. Woven of multiple-brushed cozy and warm medium-weight 170-gsm cotton flannel, the set includes one oversize duvet cover and two shams. The duvet cover includes internal corner ties that can secure your comforter through its corner loops and prevent shifting. Set is machine-washable for easy-care. I am in love with this set. It is soft and the colors are perfect for the upcoming holiday season without being "Christmas". I will be able to extend it through the winter months. Love love love. As advertised. Very soft but not too soft. this is printed and not woven. Looks great very bold! Good value for the price. It looks great and goes well with the coordinated sheets l! "Are the colors in this fabric yarn-dyed or printed on?" The colors are printed on.